We’d love your help. Let us know what’s wrong with this preview of How to Survive a Killer Séance by Penny Warner. To ask other readers questions about How to Survive a Killer Séance, please sign up. 3.5 This is the third in the Party Planning series and it's better with each addition. Presley is putting on an event for Jonathan Ellington. He is going to reveal his new holographics. The location will be the Winchester Mystery House and Jonathan will bring back Sarah Winchester (the heiress to Winchester rifles and is said to be guided by spirits) in full living detail. As Sarah's image appears, things go horribly wrong and someone is dead. Presley goes into full investigative mode to find th 3.5 This is the third in the Party Planning series and it's better with each addition. Presley is putting on an event for Jonathan Ellington. He is going to reveal his new holographics. The location will be the Winchester Mystery House and Jonathan will bring back Sarah Winchester (the heiress to Winchester rifles and is said to be guided by spirits) in full living detail. As Sarah's image appears, things go horribly wrong and someone is dead. Presley goes into full investigative mode to find the killer. This third book in the Party Planner series features a seance set in the legendary Winchester Mystery House. A local special effects company is debuting their new holographic technology at the event. The hologram accuses the owner of the company of infidelity, and techie running the device is murdered. Presley tries to get to the bottom of things, but finds a lot of creepiness in store. What is real and what is not? Super cute! Presley Parker is always in the thick of things. Presley Parker is back and finds herself evicted from her Treasure Island barracks office as the building has been condemned. Luckily Brad, the crime clean-up specialist, uses his connections to find new office space for all the evicted businesses. Presley has no time to waste dealing with building matters as she plans a Séance Party at San Jose's Winchester Mystery House for Jonathon Ellington. He plans to unveil some really cool holographic technology developed by his company. Some real A-leve Presley Parker is back and finds herself evicted from her Treasure Island barracks office as the building has been condemned. Luckily Brad, the crime clean-up specialist, uses his connections to find new office space for all the evicted businesses. Presley has no time to waste dealing with building matters as she plans a Séance Party at San Jose's Winchester Mystery House for Jonathon Ellington. He plans to unveil some really cool holographic technology developed by his company. Some real A-level guests are attending including George Lucas, creator of the Star Wars and Indiana Jones movies. The idea was to have the image of the late Sarah Winchester appear and actually converse with the people at the séance table. All was going fine until the image of dear Sarah veers off script and starts quite a commotion with her tales aimed at the host of the party. The party comes to an abrupt end but left behind is one dead body. It is going to take more than a crystal ball, Ouija board or a spiritual guide to communicate and track down this killer. Presley will have her hands full even as someone tries to scare her to death. I have enjoyed this entire series. This story like the two before is packed with loads of fun. The characters we love are back with a few new ones, some that I predict will show up again in the next book. The cool thing about this series is that they are set in real places. This story is no exception, the San Jose Winchester Mystery House is wonderfully described in this book and after you read it you should visit the website. It is a truly scary place and a perfect setting for this book. For those of you like me who are not from California or don't know a lot about the state, Treasure Island and the buildings the author uses as her settings are also very real. The author is also a party planner herself, planning over five hundred parties and events. She has also written several books on party planning. This reality makes it so easy to step right into these stories. It makes you forget that they are actually fictional, or maybe they are not, or at least not completely fictional. Mark Twain has a quote that starts out "truth is stranger than fiction..." and that may be what Penny Warner is drawing from in these wonderful stories. Take my advice, pick up this book as soon as it is released and cozy up by the fire and "escape" into the wonderful world of Presley Parker. You will not be disappointed and I hope you will come back and let me know how much you enjoyed this book. Be sure to let the author know too! She can be reached through her web page. Presley Parker's latest client is the CEO of a tech company with a new 4D technology, something like a fully realized hologram. To launch the new product, he wants Presley to put on a seance where Sarah Winchester will materialize (and thus show off the new technology). O I've lived in the Bay Area now for 12 years. The one place I want to go and haven't yet is The Winchester Mystery House. 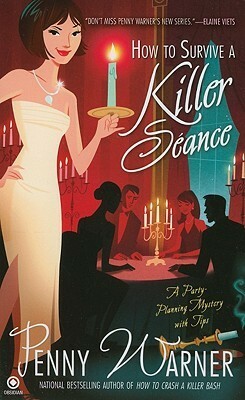 It is the setting for the third of the Party Planner books, How to Survive a Killer Seance by Penny Warner. How to Survive a Killer Seance is the third book of this series, and I was dying to read it. This time, Presley is almost obligated to plan a party for Jonathan Ellington at the Winchester Mystery House, but of course, nothing goes as planned. Dead and infidelity are the protagonists in this story, and Presley is going to be in the middle of it. As always, she starts to investigate who is the possible murderer, which was one of the party attendees. This time, the mystery wasn't so intriguing, and I suspected from the character almost since the beginning, but still it was fun to read how Presley would discover it. I was glad to see more of Presley and her boyfriend Brad, which I love. And I loved the detail of that new character in the detective department. these stories just keep getting better and better. 3rd in series, Presley the "Event Planner" is called upon by her mothers' boyfriend to throw a seance party for his son Johnatans' company.. to launch a new 4-D product that will change the world. The catch? They want it held at the Winchester Mystery House! During the party, the guy operating the 4-D projector ends up dead, and Johnathans fingerprints all over the murder weapon. With the guest list a mile long there are many many suspects and P these stories just keep getting better and better. During the party, the guy operating the 4-D projector ends up dead, and Johnathans fingerprints all over the murder weapon. With the guest list a mile long there are many many suspects and Presley is determinded to find the killer so she can get herself paid. Even though I guessed the killer early on, I just adore the characters and plotlines of these books. I hope there will be more to come. Penny Warner's "How to Survive a Killer Seance" is a winner for interesting murder mysteries set in unique situations. This time it was the famous "Winchester Mystery House" in San Jose, CA. If you like strong sleuths, Presley Parker, interesting jobs-Event Planner, and laughing out loud humor, well this book is for you. Oh, and I forgot...high technology concepts- 4D? Every character is special and sharply defined. Each book leads you through a maze so that you feel you helped Presley solve the Penny Warner's "How to Survive a Killer Seance" is a winner for interesting murder mysteries set in unique situations. This time it was the famous "Winchester Mystery House" in San Jose, CA. Every character is special and sharply defined. Each book leads you through a maze so that you feel you helped Presley solve the crime. Then at the ending...you get a glimpse of the next in the series that makes you impatient to read it! Event planner Presley Parker is hired for a seance themed party at the Winchester Mystery House. But part way through, the "ghost" goes off script. Next thing she knows, the host is missing and a body has turned up. I really like the characters, but plot could have used a bit more polish. It dragged in a few places, and the ending felt rushed. Not as strong as other books in this series, but I loved the seance setting for the party. Very creative. That's a party that sounds like it would be really cool to attend. However I did not like the characters in this story as well and some of the recurring characters just felt off. Still, overall enjoyable reading and a great light mystery for summer reading. This is just plain fun. I will definitely read more of Warner's mysteries. Not only is it a blast to read about settings, like the Winchester Mystery House, that I have visited but her characters are quirky and very likeable. Presley Parker is used to planning parties--but a seance at the famed, possibly haunted Winchester Mystery House? When someone dies during the party, and the host, a suspect, disappears, Presley finds herself trying to uncover someone using a ghost as cover. I do enjoy the settings of this series. I had hoped for a few more glimpses and history on the Winchester House where this murder was set. I enjoy the main cast of characters but am not infatuated with them as some series. Still, a solid read. I love the party planning tips in the beginning of each chapter but the mystery part is not enough to satisfy the inner detective in me. The mystery is very quickly solved by our dear Presley Parker; event planner/amateur detective extraordinaire that I couldn't help but wonder where the action is. Not the best in the series so far but the use of the Winchester house makes this an intriguing story. I love this series! And she's prompted me to go to the Winchester Mystery house this Halloween. I love Presley! The party planning details are really fun. More of her budding romance in this one and less of her other office mates. A quick satisfying read. Once again, I enjoyed the authors use of real historic locations in her stories. I have been the Winchester Mystery House and that made the story even more enjoyable! Slightly better than average cozy with your usual cast of characters. I enjoyed the mystery, I just wish that most cozies didn't have such interchangeable characters. 3rd in the series and the best so far. Looking forward to the next one! This third installment in the party planning novels was very good! I am totally in love with Brad! I would love for Presley to learn more about him so we readers can learn about him as well! Penny Warner is an award-winning author of over sixty books, including DEAD BODY LANGUAGE mystery series (Macavity winner), HOW TO HOST A KILLER PARTY series, and the upcoming Food Festival series. Her middle-grade mystery, THE CODE BUSTERS CLUB, won the Agatha Award for Best Children's Mystery.